It's taken two months for the Kielbasa Factory to recover from a bizarre incident on December 10, 2017. 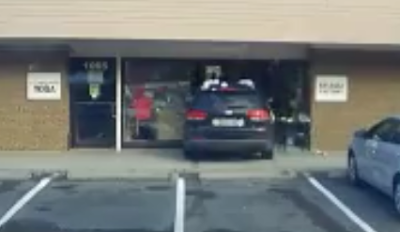 On that day, at 2:20 PM, a driver turned to park normally in a space directly in front of the shop in the Talbott Center, at 1073 Rockville Pike. Suddenly, the SUV surged forward into the storefront, causing extensive damage to the facade, the interior, and the store's electrical system. The horror wasn't over yet. As two police officers emerged from the business next door to find out what the noise was, the driver shifted into reverse, floored the accelerator, and backed into a parked car at high-speed. The actions resembled a deliberate act, but police reportedly described the driver as having been "disoriented." Fortunately, the store's insurance company facilitated complete repairs. Kielbasa Factory is tentatively hoping to reopen for limited hours around Valentine's Day. Once they get back to full operation, they will formally announce their Grand Reopening. Stay tuned for further details. I love this place! Best ham, cheese and Kielbasa around! Great that they are back! Not quit yet, according to the story. Surprising they had to close, perhaps the damage was extensive, were Fresh Baguette is open for business. "the driver shifted into reverse, floored the accelerator, and backed into a parked car at high-speed. The actions resembled a deliberate act"
Sounds more like a panic response.